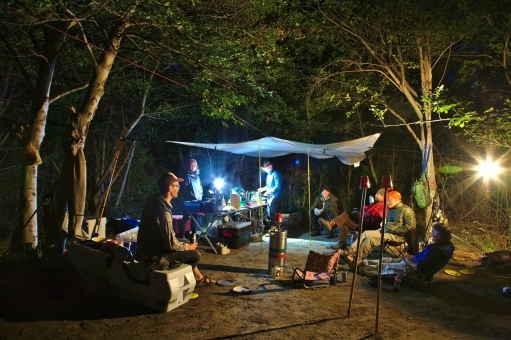 When it comes time to hit the rivers again (soon now) we can expect more company on the water—at the launch, at the take out and vying for our favorite camps. When eight out of ten of us live in a city, that’s a lot of dogs in the pack looking for the same bone. Summer is the canon vacay window for the masses. Kids home for the summer. Shorts and sandals. BBQs. Time to take it to the river. The workaround to this—as we all know—is to get out of lockstep with the masses. School calendar pretty much tells the tale. Early summer and fall are fringe to that, the idea being to find a little solitude while retaining some favorable weather values. And each destination, each watershed, each river, has its micro concerns/conditions: flow, weather, fishing or hunting seasons. 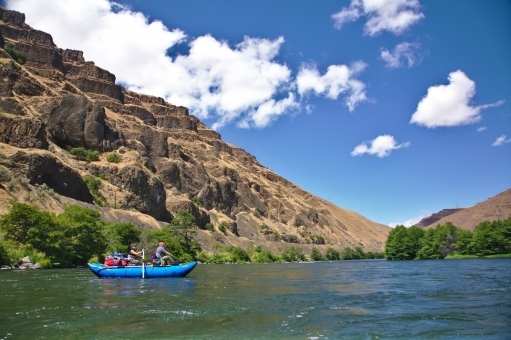 We’ll take a closer look at three rivers popular with boaters throughout Oregon, each of them bearing Wild & Scenic status. 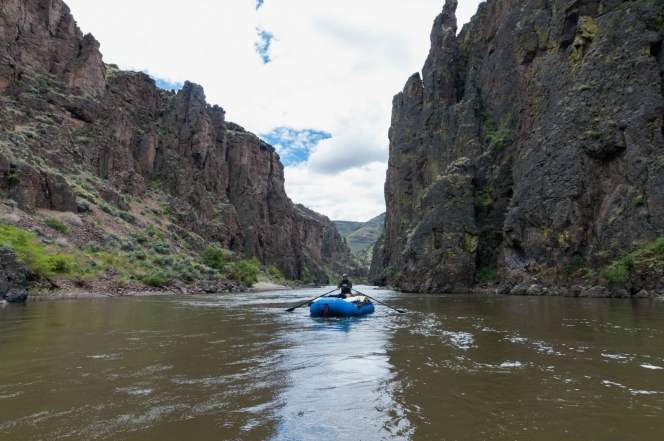 The Deschutes (two hours east of Portland), the John Day (an hour farther) and the magical and remote Owyhee situated in the extreme southeastern corner of Oregon. Holidays, of course, are anathema for fringe seekers. Three-day weekends are hard to resist but what that extra day gives you in duration, you lose in elbow room. Weekdays are your best bet if they can be had. Launching out of sequence with the crowds can provide a measure of separation. Leave on a Thursday or even a Friday and wrap a weekend and you may be surprised with what you find. Even a Sunday launch should cut the traffic by half. 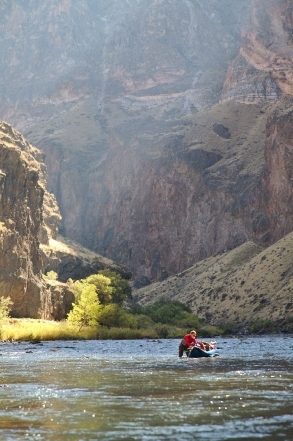 Both the Deschutes and John Day Rivers are popular with boaters in the Portland and Seattle metro areas. The Deschutes has consistently adequate flow for boaters of all stripes throughout the summer. The free-flowing John Day tapers off quickly by mid to late July from a quickly dissolving snowpack in the John Day Mountains and from irrigation draw off (twice it even stopped running). And the Owyhee, situated in what I have come to understand is the least populated portion of the contiguous USA, has a tiny window of popularity in early spring to coincide with high water, then purls through a rugged rock garden until winter rains freshen. 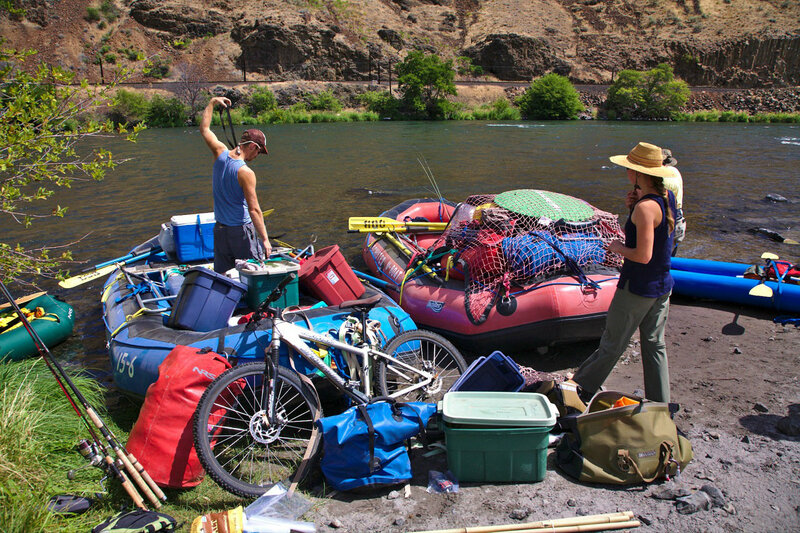 Both the Deschutes and the John Day Rivers require boaters to carry a launch permit, available online. 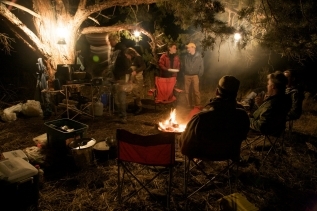 Check the BLM Availability Calendar—a handy hi-tech tool for effective fringe planning—to see how many are launching when. 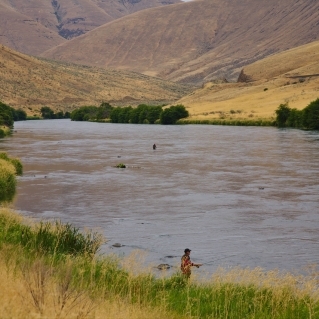 For many of us, the Deschutes is the most available of the three rivers. It runs south to north just east of the Cascades. A two-hour hump from Portland and six from Seattle, either up over the mountains and down onto the desert floor (quite dramatic) or up the Columbia River Gorge on Interstate 84, will get you there. Two long, roadless canyons bookend the road-accessed middle section surrounding the little town of Maupin. With population on the rise in the NW and a world-class fishery running hot from June through September, it becomes challenging to shoehorn in a trip. The upper canyon begins at Trout Creek, running north with nary an inch of asphalt until it reaches the six-mile post south of Maupin. 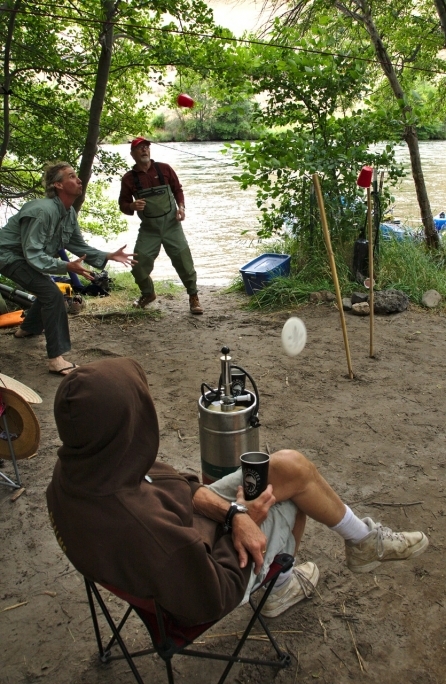 There are two primary user groups on the Deschutes, rafters and fishermen. They run similar itineraries through the upper canyon and overlap throughout the season with perhaps late May and early June being largely the province of fishermen chasing a renown salmon fly hatch. 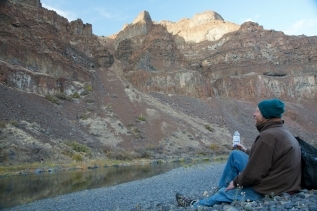 The roadless lower river canyon runs for 28 miles from Mack’s Canyon Campground to the Columbia River. Known more for its steelhead than trout, steelhead fishing picks up in early August and runs through September and extending into early October. 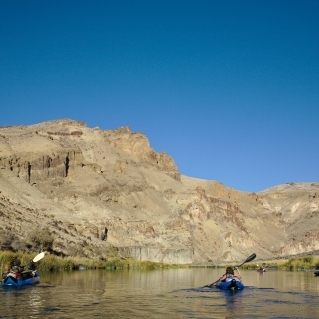 The non-fishing, pure rafting demographic might be about equally divided between the upper and the lower canyons. I would look for a window on the lower, through June and July. Best known for its serpentine, 70 mile Clarno to Cottonwoods run, or perhaps now the Thirty Mile Creek to Cottonwood (40 mile) float, you will see no roads along the John Day River as it descends from mountainous headwaters through a gorgeous sagebrush steppe to the desert-like basin of the Columbia River. The golden rangelands roll up suddenly into tall hills or towering canyon flanks of sheer basalt on either side of the river. Juniper trees, or junies as they are called, are ubiquitous. The larger specimens have a roomy understory and provide a hobbit-like shelter on a cold autumn night. The JD is a beautiful leisurely float in fringe season although one might find the canyonscape of more interest than the water unless they can appreciate the stately and relaxed currents this time of year. Core season coincides with spring runoff during May and June and is often very busy. By early summer the flow drops sharply as the heat begins to build. On the other hand, fringe season (as anywhere) will depend on what you’re looking for and what type of boats you’re in. By late July you should still have enough water for rafts, canoes and IKs, but it’ll probably be scorching hot. August into September the river usually flat lines in the low hundreds and only by October does it slowly begin to pick up. 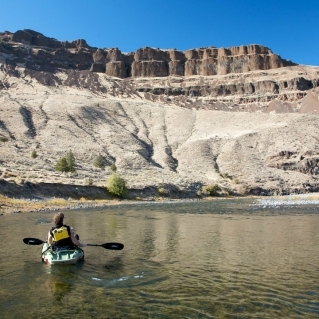 Below 500cfs rafting can become dicey with gravel bars and exposed rocks to navigate around. The bare minimum advised flow for canoes is about 300cfs with IKs at about 200cfs. In an ironic turn of events, one trip on the JD collided the fringe with the fringe. We’d scheduled a trip for steelies in early November, a little early in the run for most fishermen and we anticipated having the canyon largely to ourselves. But the freak encounter with the only other boat on the river was strange. Two guys looking like river commandos with wet suits, helmets and camouflaged guns floated by our camp in a small cat on day two, waving as they drifted past. We were on the water a couple of days later when we flushed a large covey of chukar off a gravel bar into a side canyon. As we were on the qui vive for fowl as well as fish, I got on the horn and relayed the info. A minute later, two of our boats pulled in and the guys jumped out and gave chase. Shots were fired but no birds were bagged and they returned to their boats and floated north. The irony of it all was that the two men that passed us earlier were laying up on the rim of the canyon, glassing us! We met up with them at the take out and they told their sorry tale. They’d been waiting all day up there for a trophy sheep to return up the same draw we had disturbed to high heaven. They watched the entire scene unfold. I can imagine their conversation. They said the ram was probably still running. As it turned out they had shot another animal so they had their lottery permit filled and no cause for grievance. There are no dams on the free-flowing JD and because of this, it can drop to a trickle by mid-summer. In fact, it recorded a flow of ZERO on several occasions. 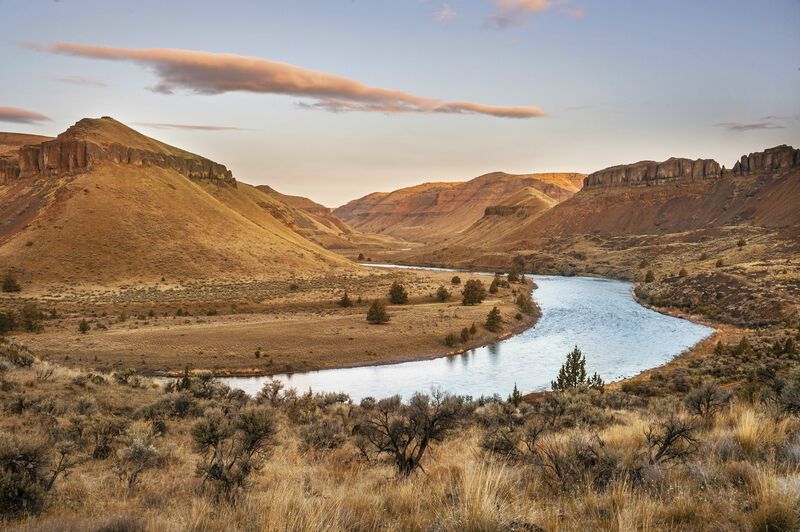 But yet, the river is a major player in several regards: It’s the largest undammed tributary in the Columbia River watershed and it’s the second longest free-flowing river in the lower 48. It’s also a huge reproduction venue for anadromous fish. The JD comes double bagged (as it were). Both Federal and State preservation programs have insured it for posterity; meanwhile, organizations like the Western River Conservancy are active in preserving the watershed in its authenticity. 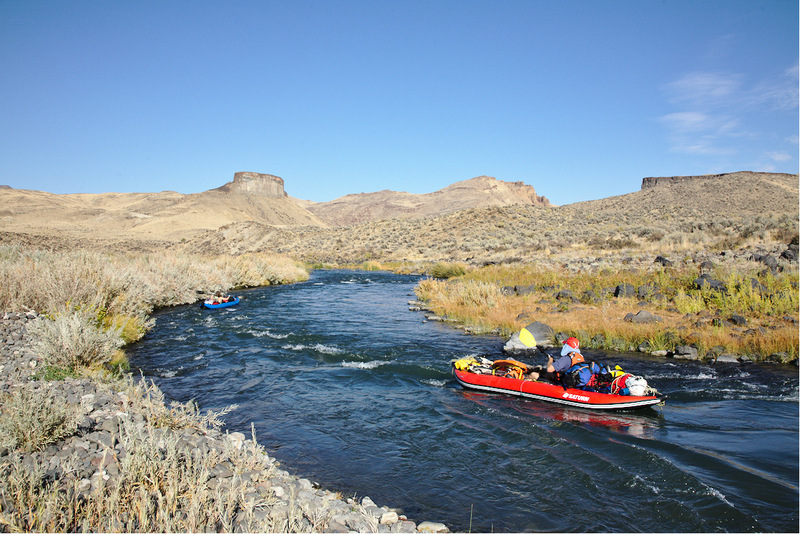 The Owyhee is another river draining into the Columbia Basin from the southern mountains and it has a similar flow profile to the John Day. Boaters make the long pilgrimage in early spring throughout the west before a myriad of boney rock gardens obviate dories, rafts and cats. IKs will still handle things and you can pretty much have the river to yourself from July through fall. A poster river for what they call ELF boating (extremely low flow), if you’re into lean travel or pack rafting you’ll be in business. When we run in October we solo paddle double IKs providing room to carry a decent amount of gear. From Seattle, it’s a two day haul to the O’. The country the canyon flows through is the least inhabited (by capita) in the contiguous 48. This is Basque country and you’ll feel like you’re in Galicia with the white cowboy hats and horsemen; it’s pretty cool. It’s a special river, largely because of sheer basalt canyons and brightly colored outcrops, hoodoos, landforms and hot springs, and because of a chance for solitude. Uber-fringe in the fall, mid-September into October. An extreme low water challenge but on the other hand you’re likely to have the canyon to yourselves, and a canyon like this all to yourself is, as they say, priceless. By fall, the CFS is in the 100 to 200 range and on a particularly dry year, below a hundred. We’ve run it right at a hundred several times, which was doable. The caveat then is that running the river is a euphemism for floating, walking, dragging and occasionally portaging. In other words, you’ll want to be here for something other than purely paddling. Don’t let the idea of minimal flow have you thinking hydraulics don’t exist. There are and one must still be careful not to get pinned under a rock in the more turbulent sections. We’ve flipped several boats and pancaked one IK around a boulder in swift water with only 125 CFS. Our first time down we brought several big canoes, one of which we’d rented from an outfitter in Hood River on the way up the gorge. We were spanked hard on that trip and the canoes were in shreds with busted thwarts and gunwales by the time we were through. When we drove up to the rental lot the dealer shook his head and told us to pony up. But it was worth it. It always is. 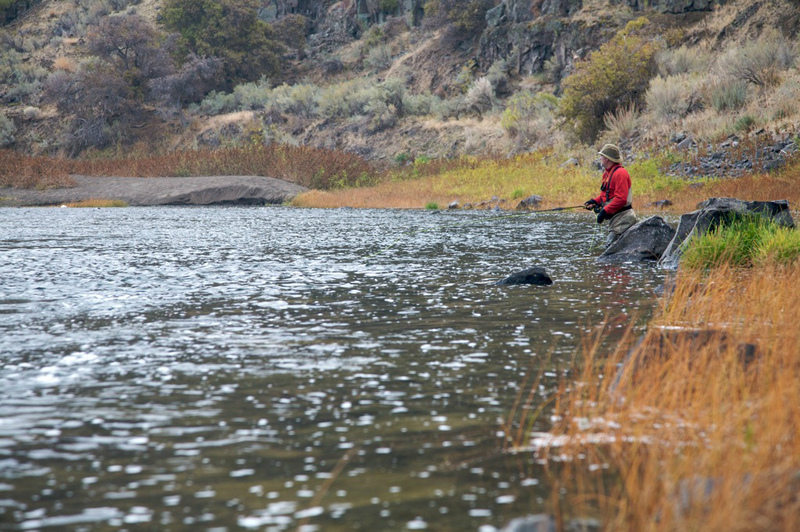 Head over to the Bureau of Land Management’s website for more information on river permits and the Oregon Department of Fish and Wildlife offers all the necessary 411 on regulations and licenses. The John Day River Recreation Guide is a great resource that covers the area from Kimberly to Tumwater Falls. An excellent John Day River map is available from the BLM at Prineville. If you’re looking for guided Fly Fishing trips, I highly recommend Ken Morrish or Brian Gies at Fly Water Travel.